Evidence from 54 studies suggests that the lone star tick cannot transmit Borrelia burgdorferi. 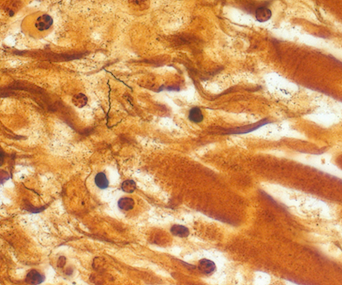 This photomicrograph of a heart tissue sample processed using Warthin-Starry stain reveals the presence of Borrelia burgdorferi spirochetes. In the United States, the black-legged tick (Ixodes scapularis) and western black-legged tick (Ixodes pacificus) are the most common vectors for Borrelia burgdorferi, the bacterial spirochete that causes Lyme disease. Several other ticks, including the lone star tick (Amblyomma americanum), historically were suspected to be vectors because of their feeding behavior on known wildlife reservoirs of B burgdorferi, including the white-tailed deer. Over the past 30 years, at least 35 research groups have published 54 studies screening more than 50,000 A americanum collected in the United States for the presence of B burgdorferi. Ticks were gathered from a variety of sources, including vegetation (35 studies), animals (10 studies), and humans (10 studies). Dr. Stilwell is a medical writer and aquatic animal veterinarian in Athens, Georgia. After receiving her DVM from Auburn University, she completed an MS degree in Fisheries and Aquatic Sciences, followed by a PhD degree in Veterinary Medical Sciences, at the University of Florida. Stromdahl EY, Nadolny RM, Hickling GJ, et al. Amblyomma americanum (Acari: Ixodidae) ticks are not vectors of the Lyme disease agent, Borrelia burgdorferi (Spirocheatales: Spirochaetaceae): a review of the evidence. J Med Entomol. 2018;55(3):501-514. doi: 10.1093/jme/tjx250. Steere AC, Malawista SE, Snydman DR, et al. Lyme arthritis: an epidemic of oligoarticular arthritis in children and adults in three Connecticut communities. Arthritis Rheum. 1977;20(1):7-17. Burgdorfer W, Barbour AG, Hayes SF, Benach JL, Grunwaldt E, Davis JP. Lyme disease—a tick-borne spirochetosis? Science. 1982;216(4552):1317-1319. Clark KL, Oliver Jr JH, James AM, Durden LA, Banks CW. Prevalence of Borrelia burgdorferi sensu lato infection among rodents and host-seeking ticks in South Carolina. J Med Entomol. 2002;39(1):198-206. Schulze TL, Bowen GS, Bosler EM, et al. Amblyomma americanum: a potential vector of Lyme disease in New Jersey. Science. 1984;224(4649):601-603. Magnarelli LA, Anderson JF, Apperson CS, Fish D, Johnson RC, Chappell WA. Spirochetes in ticks and antibodies to Borrelia burgdorferi in white-tailed deer from Connecticut, New York State, and North Carolina. J Wildl Dis. 1986;22(2):178-188. Schulze TL, Lakat MF, Parkin WE, Shisler JK, Charette EJ, Bosler EM. Comparison of rates of infection by the Lyme disease spirochete in selected populations of Ixodes dammini and Amblyomma americanum(Acari: Ixodidae). Zentralbl Bakteriol Mikrobiol Hyg A. 1986;263(1-2):72-78. Levine JF, Apperson CS, Nicholson WL. The occurrence of spirochetes in ixodid ticks in North Carolina. J Entomol Sci. 1989;24:594-602. Levine JF, Sonenshine DE, Nicholson WL, Turner RT. Borrelia burgdorferi in ticks (Acari: Ixodidae) from coastal Virginia. J Med Entomol. 1991;28(5):668-674. Luckhart S, Mullen GR, Wright JC. Etiologic agent of Lyme disease, Borrelia burgdorferi, detected in ticks (Acari: Ixodidae) collected at a focus in Alabama. J Med Entomol. 1991;28(5):652-657. doi: 10.1093/jmedent/28.5.652. Teltow GJ, Fournier PV, Rawlings JA. Isolation of Borrelia burgdorferi from arthropods collected in Texas. Am J Trop Med Hyg. 1991;44(5):469-474. Kardatzke JT, Neidhardt K, Dzuban DP, Sanchez JL, Azad AF. Cluster of tick-borne infections at Fort Chaffee, Arkansas: Rickettsiae and Borrelia burgdorferi in ixodid ticks. J Med Entomol. 1992;29(4):669-672. Luckhart S, Mullen GR, Durden LA, Wright JC. Borrelia sp. in ticks recovered from white-tailed deer in Alabama. J Wildl Dis. 1992;28(3):449-452. doi: 10.7589/0090-3558-28.3.449. Simpson KK, Hinck LW. The prevalence of Borrelia burgdorferi, the Lyme disease spirochete, in ticks and rodents in Northeast Arkansas. J Ark Acad Sci. 1993;47:110-114. Feir D, Santanello CR, Li BW, et al. Evidence supporting the presence of Borrelia burgdorferi in Missouri. Am J Trop Med Hyg. 1994;51(4):475-482. Rawlings JA, Teltow GJ. Prevalence of Borrelia (Spirochaetaceae) spirochetes in Texas ticks. J Med Entomol. 1994;31(2):297-301. Sonenshine DE, Ratzlaff RE, Troyer J, et al. Borrelia burgdorferi in eastern Virginia: comparison between a coastal and inland locality. Am J Trop Med Hyg. 1995;53(2):123-133. Ouellette J, Apperson CS, Howard P Evans TL, Levine JF. Tick-raccoon associations and the potential for Lyme disease spirochete transmission in the coastal plain of North Carolina. J Wildl Dis. 1997;33(1):28-39. doi: 10.7589/0090-3558-33.1.28. Kollars Jr TM, Oliver JH, Kollars Jr PG, et al. Phenotypic variation in Borrelia burgdorferi sensu lato in ticks (Acari: Ixodidae) and isolates from Missouri, USA. Int J Acarol. 2000;26(2):167-172. doi: 10.1080/01647950008684182. Goddard J, Sumner JW, Nicholson WL, Paddock CD, Shen J, Piesman. Survey of ticks collected in Mississippi for Rickettsia, Ehrlichia, and Borrelia species. J Vector Ecol. 2003;28(2):184-189. Barbour AG, Maupin GO, Teltow GJ, Carter CJ, Piesman J. Identification of an uncultivable Borreliaspecies in the hard tick Amblyomma americanum: possible agent of a Lyme disease-like illness. J Infect Dis. 1996;173(2):403-409. Bockenstedt LK, Gonzalez DG, Haberman AM, Belperron AA. Spirochete antigens persist near cartilage after murine Lyme borreliosis therapy. J Clin Invest. 2012;122(7):2652-2660. doi: 10.1172/JCI58813. Barbour AG, Tessier SL, Todd WJ. Lyme disease spirochetes and ixodid tick spirochetes share a common surface antigenic determinant defined by a monoclonal antibody. Infect Immun. 1983;41(2):795-804. Allan BF, Goessling LS, Storch GA, Thach RE. Blood meal analysis to identify reservoir hosts forAmblyomma americanum ticks. Emerg Infect Dis. 2010;16(3):433-440. doi: 10.3201/eid1603.090911. Rich SM, Armstrong PM, Smith RD, Telford SR III. Lone star tick-infecting borrelia are most closely related to the agent of bovine borreliosis. J Clin Microbiol. 2001;39(2):494-497. doi: 10.1128/JCM.39.2.494-497.2001. Ledin KE, Zeidner NS, Ribeiro JM, et al. Borreliacidal activity of saliva of the tick Amblyomma americanum. Med Vet Entomol. 2005;19(1):90-95. doi: 10.1111/j.0269-283X.2005.00546.x. Soares CA, Zeidner NS, Beard CB, Dolan MC, Dietrich G, Piesman J. Kinetics of Borrelia burgdorferiinfection in larvae of refractory and competent tick vectors. J Med Entomol. 2006;43(1):61-67. Zeidner N, Ullman A, Sackal C, et al. A borreliacidal factor in Amblyomma americanum saliva is associated with phospholipase A2 activity. Exp Parasitol. 2009;121(4):370-375. Armstrong PM, Rich SM, Smith RD, Hartl DL, Spielman A, Telford SR III. A new Borrelia infecting Lone Star ticks. Lancet. 1996;347(8993):67-68. Rudenko N, Golovchenko M, Clark K, Oliver JH, Grubhoffer H. Detection of Borrelia burgdorferi sensu stricto in Amblyomma americanum ticks in the southeastern United States: the case of selective compatibility. Emerg Microbes Infect. 2016;5:e48. doi: 10.1038/emi.2016.45.